This adorable piece of art come from yet another project we did during my first grade teaching days. I always loved how these watercolor projects turned out. Perfectly colorful and flowery for mom! Just take a plain piece of paper. Watercolor paper is best. Then, using a water bottle, we always sprayed our entire paper with water. 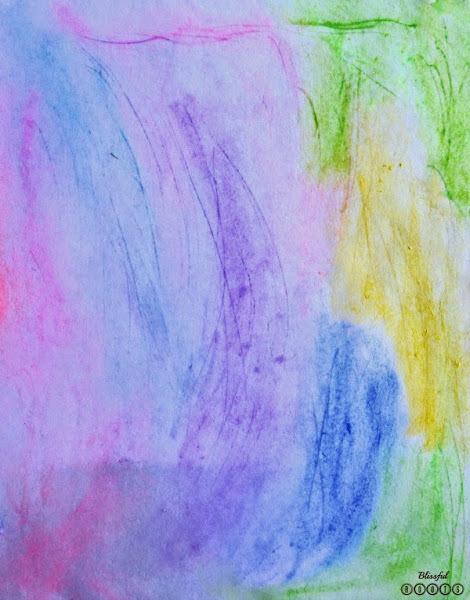 You could try just painting the watercolors on the paper, but I like the look the sprayed paper gives to the colors. They're more blended and muted. After the paper is sprayed, then let your child paint away! Still dip the brush in water before the watercolor, but you won't need a ton of water because the paper is wet. I like to encourage my boys to use a lot of colors, and to not mix them too much, or they'll just end up with brown. After the whole paper it painted, then allow it to dry. The final step is adding the black paint (you could do a black marker it you'd like). Use the finest brush you can find for this. 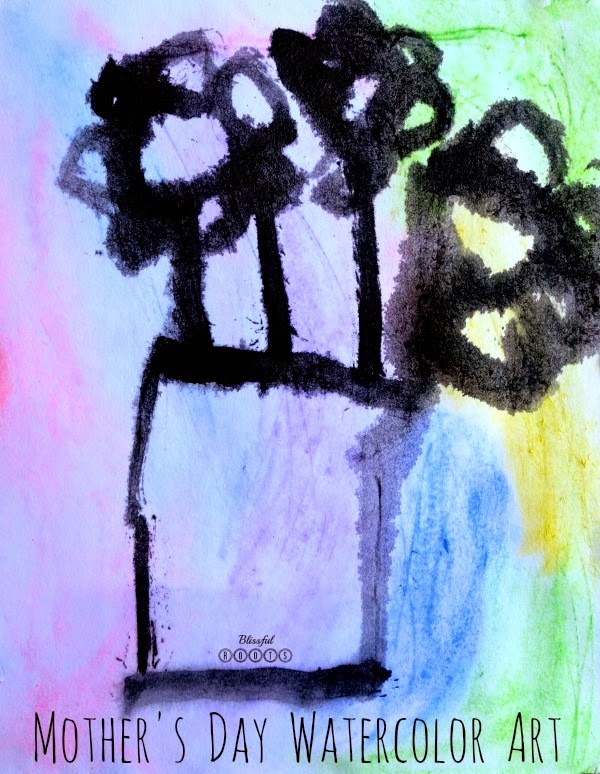 I could have given my four-year-old a finer brush for his flowers, but I still love how it turned out. He did all of the same flower, but your older kids could try and do a few different kinds of flowers (tulips, roses, daffodils, etc…). They can always practice the flowers on a separate sheet of paper first, and then paint them on the watercolor paper. Oh, and you'll want to have them paint a vase for the flowers to go in. And there you have it! The perfect Mother's Day art work for grandma or any other mother. We've given this in the past, and it's always a HUGE hit with the recipient!! Just found you via Pinterest! Love, love, love your blog. Fantastic printables. Thank you! I will enjoy slowing making my way through your blog and soaking up all of it. So glad you found me! And thank you for your kind, kind words! !